For years, Braemar Golf Course in Edina has been a great place for anyone to learn the game on their Executive Course, and now it’s even better. In 2016, local golf course architect Kevin Norby helped to renovate the course which resulted in the Academy 9. Rush Creek Golf Club in Maple Grove is famous for its championship course with challenging holes and beautiful vistas, so it only made sense for them to add a nine-hole course for younger players, which they did in 2012. The Mac Nine par three course is touted as family-friendly and a great place for bigger hitters to practice their short game. The Chaska Par 30 was built in 1971 by the City of Chaska and is related to the Chaska Town Course, not far from the first tee at Hazeltine National GC, where the most recent Ryder Cup Matches were held. The Chaska Par 3 is more than a par three course and has plenty to sink your teeth into if your kids are working to step up their skills. The Robert Trent Jones design has average-sized bent grass greens, wide fairways and water hazards in play on five holes. The golf is fit for everyone here from The Garden, to the 27 championship holes of The Pines, and 18 more down the road at the recently-renovated Preserve. Grand View’s Garden Course is a 2,500-yard par 35 course is fitted with six inch “big cups” to make it very playable and fun for everyone. In addition to the highly-rated Classic, Madden’s is also home to the Social 9, which is billed as “a place to have some fun.” It was just that for my entire family, as some of the holes challenged us and others were perfect for a beginner to find some success and acquire the first bit of confidence in the game. Take a dollar bill and put it on the green. Go ahead and take a tee and sink it through the bill and into the turf so the bill stays still. Then have your child try to putt to the bill from 10-feet. If the ball stops on the dollar bill, give the kid the dollar. You’ll see goal setting in your child that you may have never seen before! Brad Pluth, PGA Professional and Director of Instruction at Halla Greens in Chanhassen, MN has a drill that he calls the 2 x 2 x 20. It goes like this: no more than 2 tips for your junior at a time and you change your coaching tip every 10 minutes and no more than 2 times in 20 minutes. After 20 minutes, you change your location because often kids get bored beyond 20 minutes. 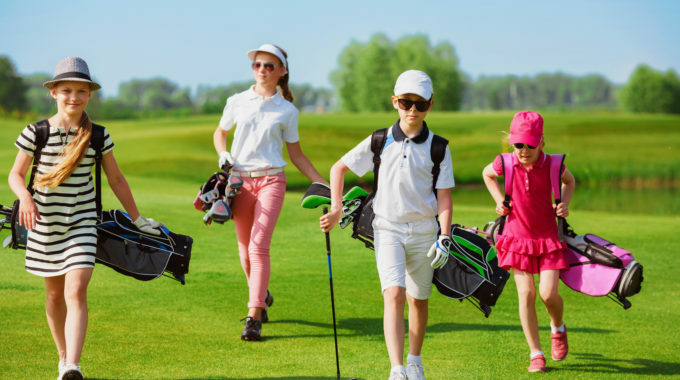 This just scratches the surface when it comes to great Minnesota golf courses for kids and beginners. Check them all out and sign your crew up for your own customized day or even a family getaway.